I used to be a normal person, but now I’m a rat lover. That said, the theme of the current Bulletin couldn’t be more appropriate for sharing this particular story. For, while I’ve indeed long proudly quoted the adage “normal people worry me,” I have to confess that once upon a time I wasn’t quite as far from normal in the rat regard as I’d like to here profess. Yes, my husband and I are both lifelong animal lovers. And yes, I did once take the slightest step in testing the theory I’d occasionally heard put forth – that rats aren’t so awful after all – by (very) briefly and (even more) lightly running a hand over a couple in one of those chain pet store’s open display bins. But, the thought of actually purchasing one – and thereby taking the chance of an experiment going as badly awry as generations of rodent fear bred into the Homo sapien psyche naturally leads one to expect – prevented even this self-professed “crazy person” from indulging in such obvious insanity. Of course, that stubbornly shortsighted viewpoint (as I now see it) clouded my judgment (something fear too often does) as it pertained to another trait built into Homo sapiens: the ability to evolve. And, as so often happens, I was reminded of this when suddenly thrust into most unusual and unavoidable circumstances involving – you guessed it…a rat. As previously noted, my husband and I are die-hard animal lovers – meaning our fear for an animal’s safety quickly proved stronger than our natural fear of rats. That doesn’t mean we rushed right to the rescue without thought, I hasten to add; but after a mere few moments’ contemplation, we knew we couldn’t possibly leave this living being there to almost surely meet a terrible demise. Finally, my husband knelt down and put out his hand – and much to our surprise, the grateful little gal (as we later learned her to be) immediately hopped aboard! It was evident from the broad white markings on her belly and her total comfort with people that she must be a domestic pet. However, I can’t say that knowledge in itself would have guaranteed abandonment of our reservations regarding rat handling had she not so quickly proved such a charming individual, wholly apart from her (as ingrained stereotypes would have us believe) distasteful outward form. As I held her on my lap (and my husband called our vet for a bit of guidance), she began softly nibbling on my sleeve, prompting the realization she must be hungry. Since our vet informed us rats will eat a wide variety of foods, we stopped at a nearby convenience store and bought a small bag of “party mix” containing cereal pieces, pretzels, breadsticks and the like. She eagerly accepted these morsels and we were utterly captivated by how delicately she munched away, holding each piece of food in her tiny front paws. When she’d finished, I offered her water from a soft-drink cup, and she took a long drink in equally neat and efficient fashion. Within an hour we’d fallen quite completely under her spell, and when a careful watch of our newspaper’s lost and found section turned up no sign of a missing pet rat in our area, I can’t even begin to express the relief we felt that “Molly” was officially ours. One might say the moral of this (thankfully) true tale is “the devil you don’t know” may be “an angel in disguise.” And, I can honestly say few creatures (of any species) I’ve met throughout my lifetime have seemed more angelic to me once I opened myself to their acquaintance. 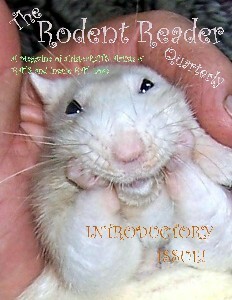 As a result, I now write regularly for rat publications, have rat photos on my address labels and personal checks, and even include a Dear Abby-like column offering “madvice” from the perspective of a rodent single mom in my monthly e-newsletter. Yes, it’s apparent Molly opened me up to a whole new world, and undoubtedly changed my life for not merely the “better,” but the very best. I suppose it only stands to reason a Mensan should be someone who “thinks outside the box.” I just had no idea the box in question might be one that carried mail. In my case, however, every such receptacle I now pass serves as a reminder of the possibility found in seeing what’s outside it, and stands as an object of such beauty I’d have never before thought possible. Of course, each also serves as a reminder of something else: sanity truly is – ever so vastly – overrated.